Self-confidence regarding one’s teeth has an impact as to how the person feels in general, but also more specifically about one’s appearance. Dental implants are the ideal and most modern solution in cases where teeth have to be replaced due to, loss of one or more teeth, periododontitis, dental decay, injury etc. Dental implants can be used irrespectively of one’s age, provided oral health is satisfactory, through a simple and painless procedure using local anesthesia, that doesn’t affect surrounding teeth. Dental implants can be placed in the bone in the upper and lower jaw, where gradually begins a bonding process between the metal and the bone. It is no exaggeration to say that they look and feel like one’s own natural teeth! Let Smalto Clinic provide proof that this is possible! Modern dentistry allows, in many cases, for the placement of dental implants, right after the extraction of natural teeth and the loading with teeth, within 48 hours, thus eliminating the waiting period and making the whole procedure simpler and easier to handle, for both patient and dentist. Clinical practice as well as related research has shown that this method has excellent results as regards both the stability as well as the aesthetics. This technique is particularly common in cases of dental implants in the lower jaw, where all teeth can be supported on 4-5 dental implants (all–on-4 prosthetic rehabilitation). The best option in modern dentistry when it comes to dental rehabilitation is dental implants. Dental implants, which are used in cases where some or all teeth are missing, are made of titanium, have the shape of the tooth root and have been around since 1980. They come in 2 parts: one replacing the tooth’s root, which is placed through a small operation underneath the gums in the bone of the jaw, and the second part that is the visible part in the mouth on which the tooth is placed. 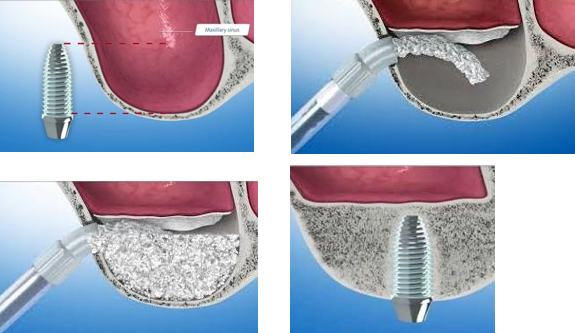 Dental implants are placed using local anesthesia in a dental setting, through a technique which guarantees their right and accurate positioning, thus assuring their longevity and providing the best aesthetic results. The implants are covered with the gums and remain in the jaw for 2-3 months, to allow for the necessary bonding with the surrounding bone (osseointegration). After the necessary waiting period, the implants are uncovered and the next step of preparation for the prosthetic work begins. Meanwhile, the patient can use temporary bridges or dentures. Is the process of placing dental implants painful? The absence of sensory nerves in the jaw bone in most cases means no pain. The majority of patients, who undergo the process, state that the discomfort is much less than expected, while in the few cases where minor pain is observed, a simple painkiller is enough. A successful dental implant placement, requires the presence of an adequate amount of good as regards quality bone at the position to be used. Where the bone is not enough or it is of poor quality, various bone grafting techniques can be used. In cases where there is not enough bone in the upper jaw area (sinus), bone grafting can take place to allow for the placement of dental implants. Do I have to place a dental implant for every teeth lost? In order to come up with a treatment plan covering the patient’s needs and number of implants required, it is imperative to carry out a detailed examination, including a panoramic X-Ray, or in some cases, even a computer 3D tomography. In cases where extensive prosthetic work is to be done, there is NO need for replacing each lost tooth with an implant. Dental Implants are the ideal solution for ALL ages! What is important is the general health and oral hygiene of the patient. In cases of patients who suffer from other health problems, dental implants can be placed following consultation with their doctor. In those rare cases where no bonding is achieved between the bone and the implant, the implant is removed, the area is cleaned and after a period of some weeks, a new implant is placed. Can smoking or periodontitis affect the success of dental implants? Smoking substantially reduces the success of dental implants, therefore it is recommended to refrain from smoking some days before the procedure, as well some days after. Implants can be used on patients suffering with periodontitis, following a proper periodontal treatment and control of gum inflammation. As always, daily oral hygiene and dental care are of paramount importance. What is the life span of dental implants? There are many determining factors regarding the success of dental implants, however, most important are their right positioning as well as the maintaining of good oral hygiene. Dental implants may not run the risk of tooth decay, however they may be affected by peri-implantitis, which is the inflammation of the gums and the bone around the implant. Consequently, it is of outmost importance to brush them daily and correctly and to have them checked regularly, exactly as we do with natural teeth. Smoking as well as too much pressure on implants as a result of bruxism (teeth grinding), can reduce implant success. However, research has shown that in the 30 years of using dental implants, the success rate of related prosthetic work is more than 90%, which makes them the most reliable choice of modern dentistry.